Many consumers usually stick with whatever keyboard came along with their systems. But you should know that there are many benefits that come with choosing the right type of keyboard. A keyboard is the second most used computer component, so it makes sense to choose the best one. Your fingers and wrists deserve a comfy keyboard. Ideally, you need a wireless keyboard that’s reliable and fast. A really good keyboard will make your work or gaming sessions more efficient. The best keyboard should have an ergonomic design to protect your joints and nerves. It should also be comfortable to use. Many people don’t realize that having the right keyboard is extremely important as this can significantly improve performance. If you plan to invest in a new keyboard, you’ll need to make some decisions such as whether you want a radio frequency model (RF) or a Bluetooth one, you will have to decide on the type of switches that you want and what kind of ergonomic features you need. If you’re looking for a comfy mini wireless keyboard, check out the list below and get the keyboard that best suits your needs. 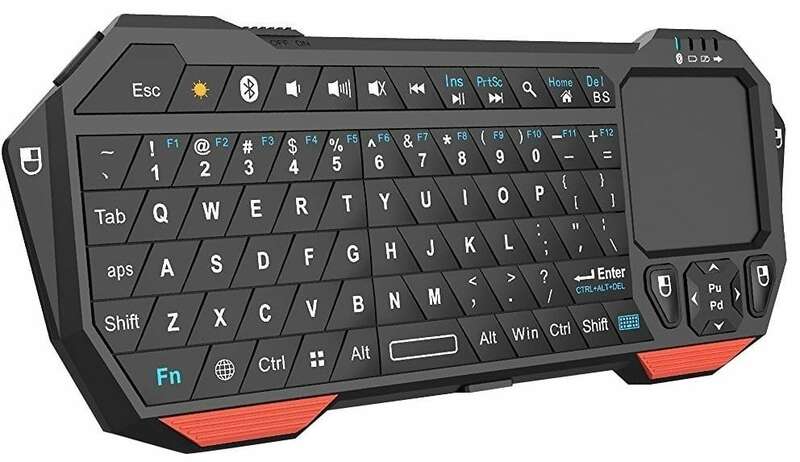 This keyboard promises to be one of the best mini wireless keyboards, and it boasts some great features and an ergonomically handheld design. The Globetronic Pro mini keyboard is built for air control. You can use it on PC, tablets, smart TVs, and more. 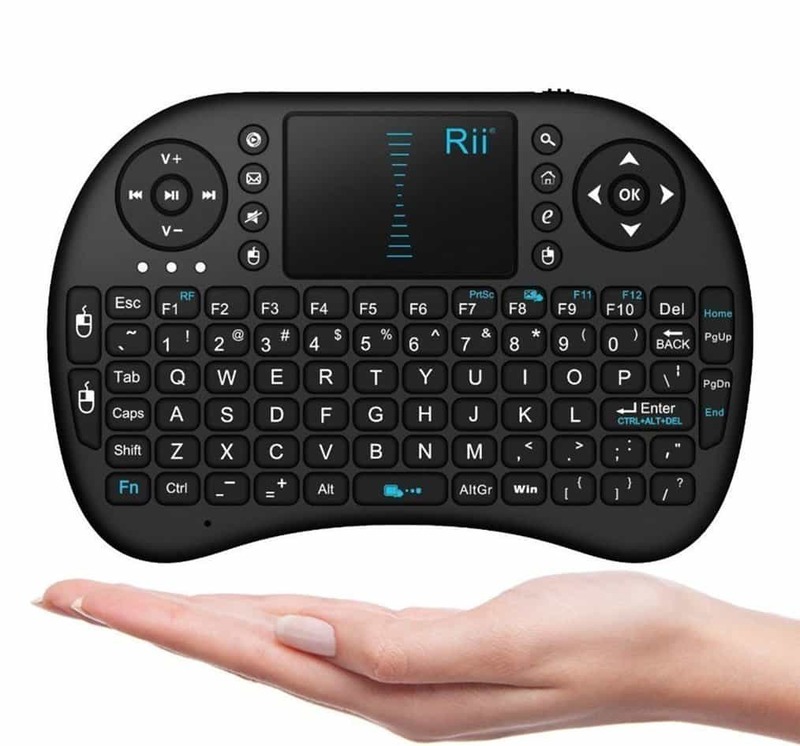 Its user-friendly design, the led backlit buttons and the full qwerty and its 360-degree flip touchpad will help you eliminate the issues that come along with simple functional remote controls or keyboards. The 2.4g wireless technology provides a simple connection, and you can control it from up to 10 meters from any enabled device. It features a highly sensitive and dpi adjustable touchpad that provides smooth navigation and perfect control. The led backlit buttons with backlight function allow you to use it in the dark. Its rechargeable 300mAh battery with MSDS detection certification can power you for one month after it’s fully charged. Users said that this keyboard is very versatile and added that it can be placed in any kind of backpack, case or handbag. One downside would be the fact that it works only with its own dongle. Some users were let down by limitation. All in all, the keyboard’s solid construction, its ability to quickly establish a connection and the fact that it is not flimsy, featuring a rubbery feel and grip instead of some smooth plastic are some of the key elements that pleased most users. 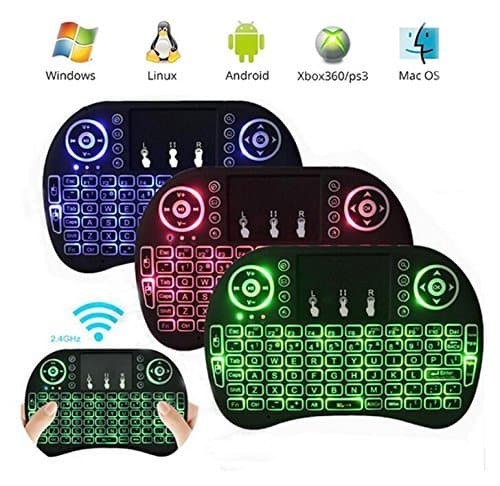 This mini wireless qwerty keyboard features a great TouchPad combo, innovative and elegant shape with USB interface adapter. 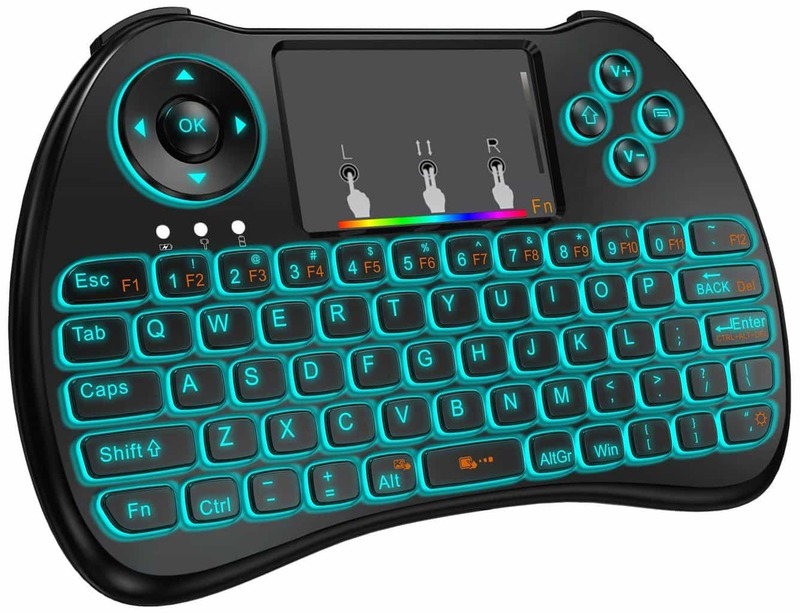 It has 92 keys, and the touchpad DPI has adjustable functions; the mini qwerty keyboard has multimedia control keys and PC gaming control keys. The built-in highly sensitive smart touchpad has a 360-degree flip design. It features an auto sleep and auto wake mode which will turn out to be very effective concerning the battery life; after three minutes without performing it will go into sleep mode, and you will have to press any key for one second to wake the device up. The keyboard’s ergonomically handheld design is easy to carry and operate. The built-in removable and rechargeable Li-ion battery features longer standby time than most keyboards. One of its primary setbacks is the range according to some users, but others find is appropriate; it is about 8 to 10 ft. Another downside is the fact that the touchpad is overly sensitive and sometimes skips a beat or lags a bit. But most users adored the intelligent layout and the comprehensive set buttons for PC features (F11 and 12 as alt keys, volume up down and mute, play, pause, forward and backward, page up, page down, Windows key, email, home, left and right mouse button, a single button “ctrl-alt-del” etc.). The keyboard comes with an innovative and unique design. Its functions and layout guarantee the best handheld control. It is both portable and elegant, and you can enjoy convenient typing and multi-touch navigation straight from your couch. The multi-touchpad and the scroll bar allow great scrolling, screen flipping, mouse clicking and using it as a Smart Phone. The built-in rechargeable Lithium-ion battery is high quality, and the device also features auto sleep/wake mode. You can very quickly switch between Android, Mac and Windows operating systems. The keyboard has a really nice feedback as the click feels good and you can hear it. You can type much faster with its help that with the on screen keyboard, especially when you have to mix numbers and letters in your text. Pairing will be remembered from previous sessions even when you turn off the keyboard and the device. Most users loved using it, and they also loved that fact that it pairs easily with their devices. 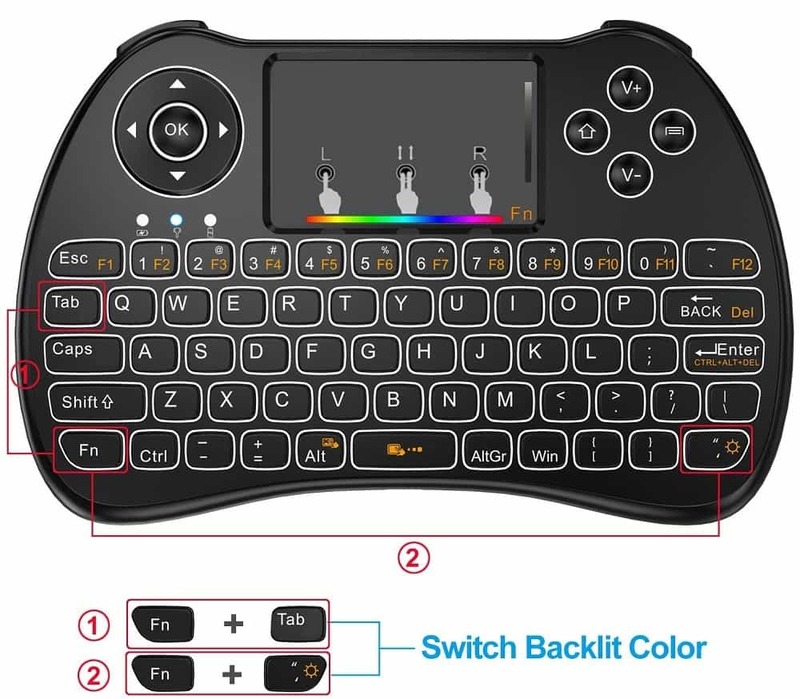 The 2.4GHz RF technology, the LED backlit with USB interface adapter and Rechargeable Li-ion battery are some of the keyboard’s pluses. The keyboard provides excellence anti-interference, stable transmission, and precise localization. It has a built-in sensitive smart touchpad that supports multi-finger functions, and a single finger click has the left mouse function; the finger clicks have the right mouse function and with double fingers dragging you can scroll the screen. 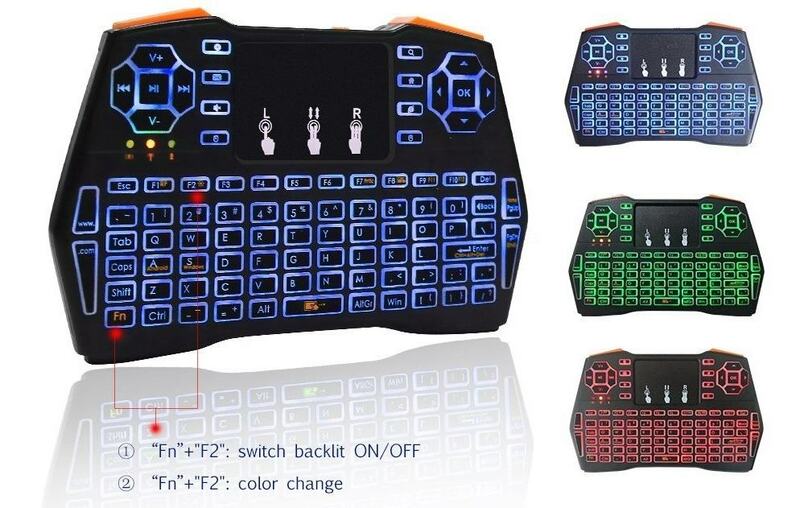 The handheld keyboard has three color backlit, and it helps a lot when used under poor lighting environment and silicone keypads. The keyboard features excellent elasticity and little noise. It has innovative shapes and it is portable and environmentally friendly. The Ergonomically handheld design is easy to carry and operate. 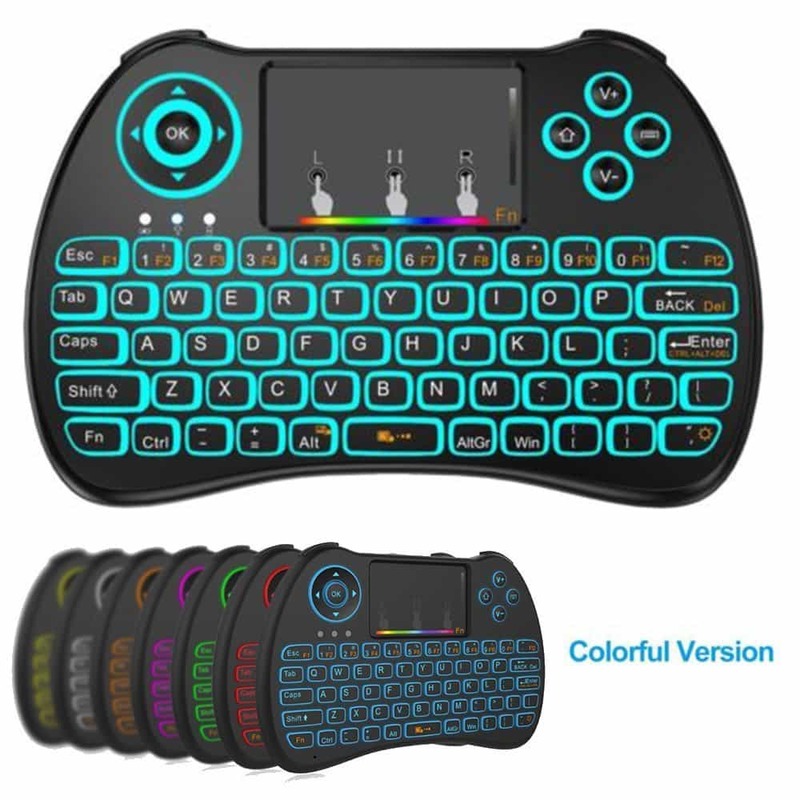 The multimedia qwerty keys allow users to flexibly control in their hands when they surf the internet, watch TV, listen to music and play games. Even if the plastic from which is made felt cheap for some users, this only happens because the keyboard is so light. It also features some stippling that adds some texture and a high quality feel and look. Users also appreciated the Li-ion battery that is of decent quality as well. While you charge the unit, there is a blue led that will turn on, and when the charging is done, it will turn off. The mouse pad turned out to be very responsive and better than expected — it is comparable to the pad on laptops. This keyboard features a frosted surface that makes a good balance between visual sense and touch sense. It is made out of a skin-friendly material, and it feels comfortable while you’re using it. It can be applied at any angle and it will not be limited by the installation position; the available distance is as long as 15 meters. This is the perfect replacement for the custom controller or mouse as it perfectly combines keyboard and touch pad. The compact casing is very comfortable, and it makes it easy to carry the keyboard around; it features both high quality shockproof and sweat proof material at the same time. The keyboard will go into the sleep mode after 3 minutes of non-use to conserve the battery power. This model does not include a laser pointer or a backlight keyboard. The tiny USB adapter and the Li-ion battery are stored and accessible in a back compartment. The power light will turn off once the keyboard is fully charged. You should be aware that Windows 7 will take several minutes to install the driver. Another important thing is that depending on the operating system that you are using, you may need to re-sync the keyboard and dongle if the keyboard does not connect after five minutes. Another minus seems to be that the touchpad sensitivity is not that good. The touchpad DPI has adjustable functions, and it is a very sensitive smart touchpad with 360-degree flip design. The convenient distance of remote use is up to ten meters. The 2.4G RF wireless technology features very high stability. It is compatible with the Rii i8 function, and its design and quality are improved. It features an innovative shape, and it’s portable and elegant. The keyboard is comparable to the real notebook touch pad. The USB receiver is placed into the keyboard which is beside the battery slot. The product features 2.4G wireless connection, but there is no Bluetooth function. You should remember that you can only use it below 2A USB plug change because otherwise, you can burn out the product. Users really appreciate this keyboard. The buttons also work great, and the touchpad works wonders as well. This user-friendly mini wireless keyboard has a really nice design, featuring a matte touch feeling, and a powerful internal lithium battery. You’ll also find two separate keys at the top of the keyboard which replace the left and right mouse buttons. The mini keyboard is designed with a full qwerty keyboard and a touchpad. This keyboard has the size of a small phone, but it has the same functions as a laptop keyboard. For instance, you will be able to lay on your bed and watch your favorite TV programs without being bothered by the lack of functions of the default remote controls. The keyboard features a built-in 300mAh battery with MSDS detection certification. The battery features a power-saving mode. When you’re not using it for three minutes, it automatically goes to sleep. Most users said that this keyboard is very user-friendly and neat, making searching online quicker. They also confirmed that the backlight is a plus, especially since you can turn the backlights on and off to prevent useless illumination. It performs flawlessly, and it features excellent portability. After you have checked out all these mini wireless keyboards, buy the one that matches your needs.